In June, we made our way south from Montenegro to Greece. As we were only travelling by land, we didn’t have a set plan, timeline or schedule — if we enjoyed a city, we’d stay another day, if not, we’d move on. We started the month meeting my friend Laura in Montenegro. 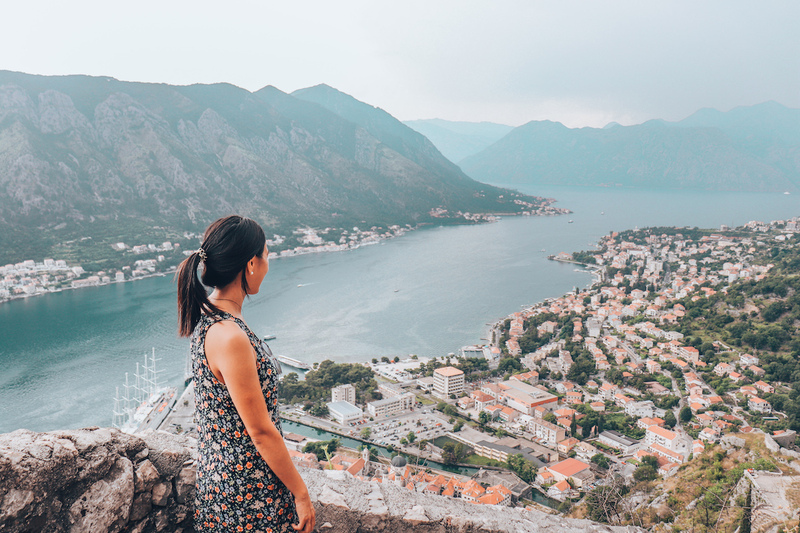 She was on vacation in London and had the time to take a sidetrip, so we spent a few days together in Kotor and Budva, two of the most popular vacation towns in Montenegro. Kotor was like a mini Dubrovnik. There is an old-town that you can walk through in 15 minutes, and also a fortress/castle viewpoint you can climb up for a beautiful viewpoint of the Bay of Kotor. 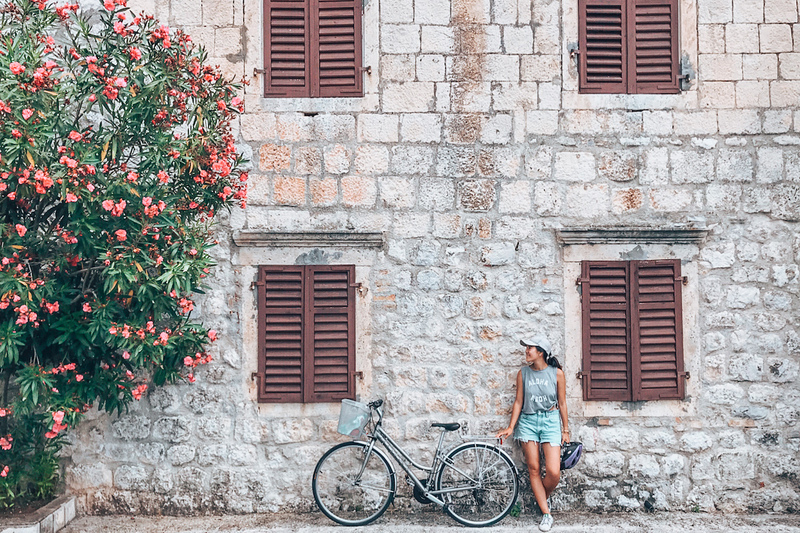 Steve and I also spent a day renting bikes to bike around the Bay of Kotor…we biked for a total of 35km in a single day! Originally we tried to bike around the entire bay in a counterclockwise direction, but the bike-friendly path turned into dangerous highway, so we went back the other way — clockwise — as far as we could, and called it a day. Budva is a 45 minute busride South from Kotor. It also had an “old town”, but with more of a beach/vacation vibe. We stayed two nights, and spent a relaxing afternoon at the beach. When we parted ways with Laura, Steve and I continued South and bussed into Albania. 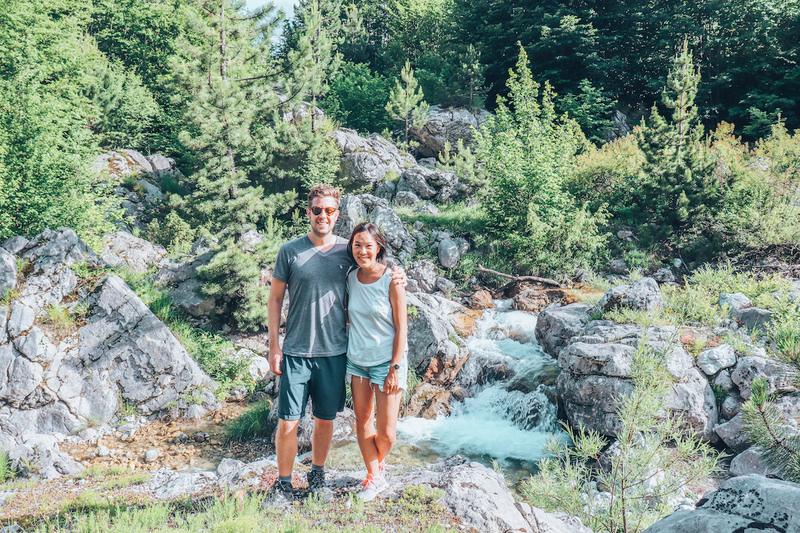 We really enjoyed our time in Albania — this country, and its unexpected beauty, hospitality, and affordability, has been one of our highlight countries of our travel so far. We arrived at a small town called Schkoder. The main part of town is quite small, there was one main pedestrian walking street, filled with restaurants and cafes. Our hostel recommended us to check our a restaurant named Sofra for traditional Albanian food, and we enjoyed it so much that we went back three times. We certainly take comfort in the familiarity! The grilled vegetables (eggplant, zuchinni and pepper grilled and drizled on with balsamic vinegar) there, and the rest of the country, were fantastic. In fact, Steve and I ate a mostly vegetarian diet in Albania, something we were really surprised by. We expected that Eastern Europe would be very meat heavy, but in fact, it was the grilled vegetables and salads which we enjoyed the most. 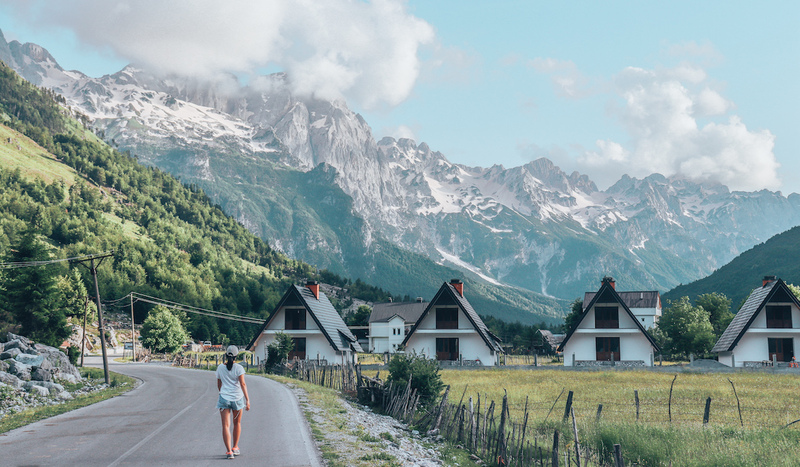 The highlight of Albania for us was the Valbone to Theth hike we did between the small villages in Northern Albania, an 18km hike (give or take a few KM’s depending on your start and end point) between the villages of Valbone and Theth. Arriving in Valbone, we were awestruck by the beauty and clarify of the snowcapped mountains. The town of Valbone had no town centre, it was basically a bunch of farm-like properties scattered along the main highway. We hadn’t booked accommodations in advance, so taking the advice of another traveller, and we tried our luck at the guesthouse she was recommended to by another traveller. The guesthouse (which had outdoor picnic tables and an amazing view of the mountains) turned out to be a great option — clean, cozy and cabin-like, with a rustic stone exterior. For 20 Euros each, all our meals were provided for, including a packed lunch for our hike the next day. The hike was perfect. We really felt like we had discovered a hidden gem — this was exactly the off the beaten track, the road less travelled, experiences we were looking for. The entire hike was so beautiful — especially when we zigzagged upwards through grass fields with wildflowers as horses grazed on the grass nearby. It was so idyllic and beautiful it seemed unreal … not to mention the fact that we were in the foreign land of Albania. Another highlight of the hike was a family-owned cafe we stopped at. They kept canned drinks in the cold river water in a carved out wooden log. After our hike experience we made our way to Tirana, Albania’s capital city. We expected a post-communist country to be old, grey and run down, but it was quite the opposite. There are many wide pedestrian walkways with al-fresco dining, cafes and ice cream shops. They are building a new town square, buildings are colourfully painted, and there are both modern art installations and street art throughout the city. On our first night in Tirana, we met up with some friends (who we met after our mountain hike) and ate at an unbelievably trendy and modern restaurant and cocktail bar — ordering negronis in celebration of the late Anthony Bourdain (RIP). 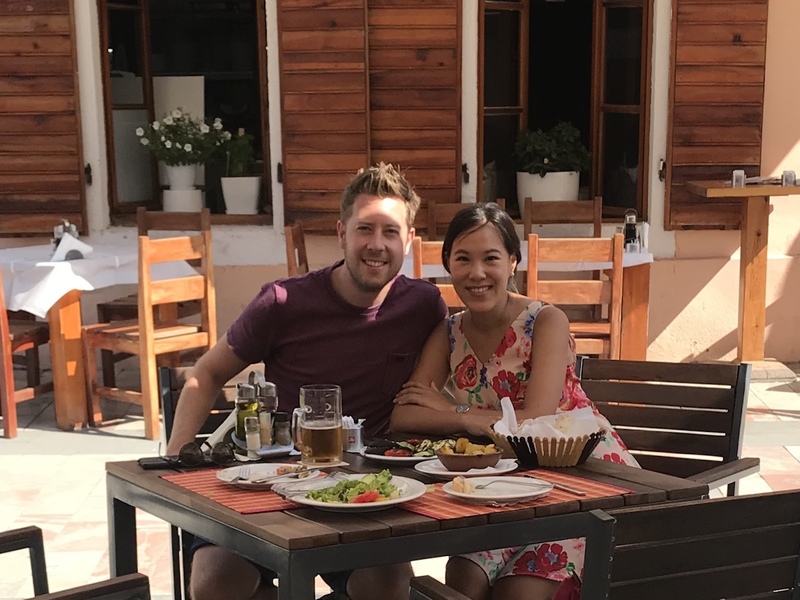 We spent a day in Berat (a small town in Albania, known for its houses with a lot of windows) then made our way to the West coast where we made our way south from beach town to beach town. A highlight was Himare — the town itself was a clean beachfront town. We literally got on the bus, and didn’t exactly know which town we were getting off at. Then it started raining, and Steve and I decided we’d get off the bus when it stopped raining. We ended up in the beach town of Himare, a small clean town. We didn’t have any accommodations booked, but at the busstop, a guy around our age connected us with his sister, who was renting out a room in their house for travellers. Maybe this act of trust wouldn’t be safe or acceptable in other countries, but being that we were in Albania and the people we had encountered hare known to be trustworthy, honest, and hospitable, we accepted and stayed. But, being that this was Albania, and we had. We ended up hanging out with Jim the next day too at the beach. 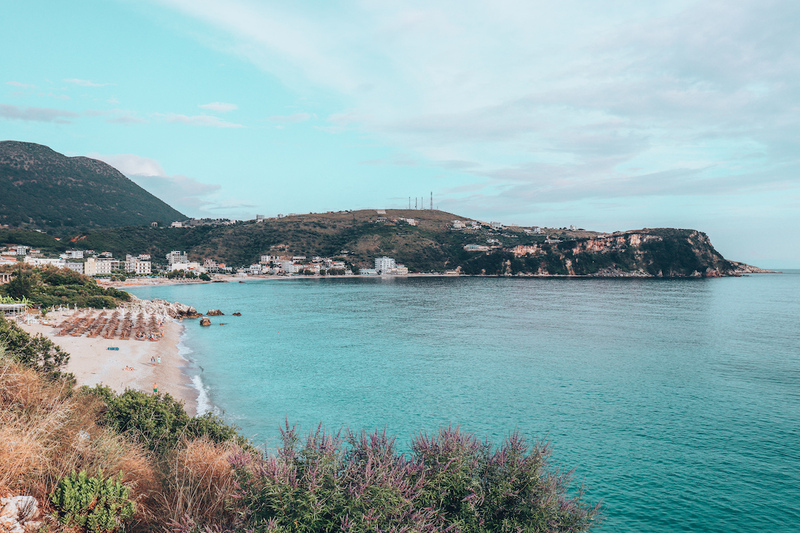 Unfortunately, in our last stop of Sarandë in Albania, Steve came down with a horrible bout of food poisoning which was actually very traumatizing for me. We had a very rough night and missed our bus to Greece the next morning, yet already checked out of our guesthouse at 6am. We had to spend 12 hours killing time, with very little sleep, waiting for the next bus — the overnight bus — to come at 6pm. I’m usually not a fan of long bus rides, but I couldn’t wait to get on the bus and pass out. The ride was pleasant, I was so tired I got more sleep than expected. We checked into our Airbnb in Athens at 5am in the morning, and slept in until noon! Planning for Greece was a lot more complicated than I expected. For one thing, the country is huge! There are hundreds of islands to choose from. We moved in a somewhat orderly manner, from West to East, so we could island hop our way from Greece to Turkey. 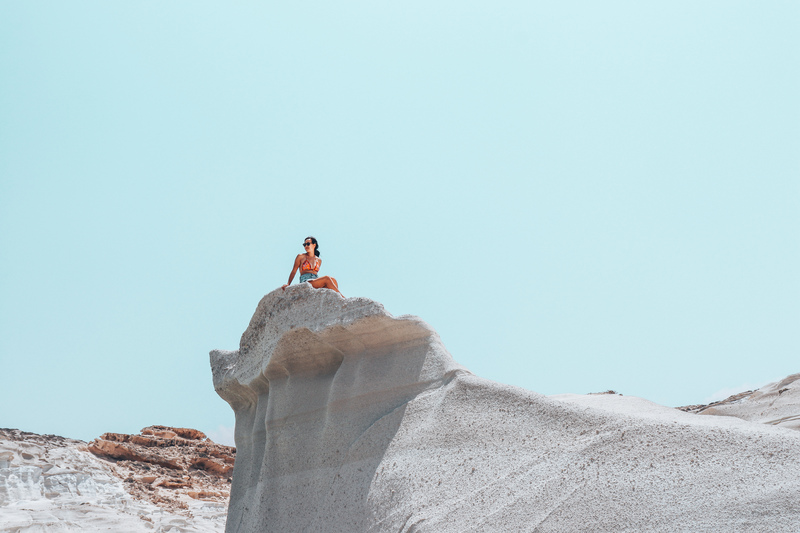 We started off in Milos, made our way to beautiful Santorini, then Naxos (where we did a Greek food and culture tour), and finally Kos, before crossing into Bodrum, Turkey by boat. In Santorini, Steve and I hired a professional photographer to snap some photos of us as memories for our travels. You can see the photos from our Santorini photoshoot here. Thank you so much for keeping up with our travels reading our June reflections on Modern Mix Travel! Next destinations: Turkey, Ibiza, and London!